Research project 2019. Rickard Sjödin, engineering physics student at Umeå University, is working in a research project where he will classify tree trunks in airborne laser scanning data collected from low altitude (150 magl). Advisors: Mattias Nyström and Johan Holmgren. Project work 2019. Two students from the engineering physics program at Umeå University will use deep learning methods in 3D to segment single trees in terrestrial laser scanning data. Advisor: Mattias Nyström. Project work 2019. Three students from the engineering physics program at Umeå University will evaluate the accuracy of the DJI Phantom 4 RTK drone. Advisors: Mattias Nyström and Jonas Bohlin. Summer project 2017. 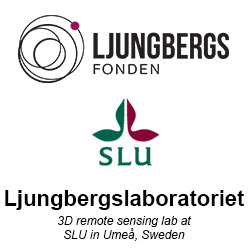 Two students from the engineering physics program at Umeå University did a project course during the summer and build a “device” to take photos of eggs and create 3D from the photos. Advisor: Jonas Bohlin. Summer project 2016. Three students from the engineering physics program at Umeå University did a project course during the summer and built a “device” for automatic photographing for TLS. Read more. Advisor: Mattias Nyström.